Santa's sleigh gets the brand treatment. 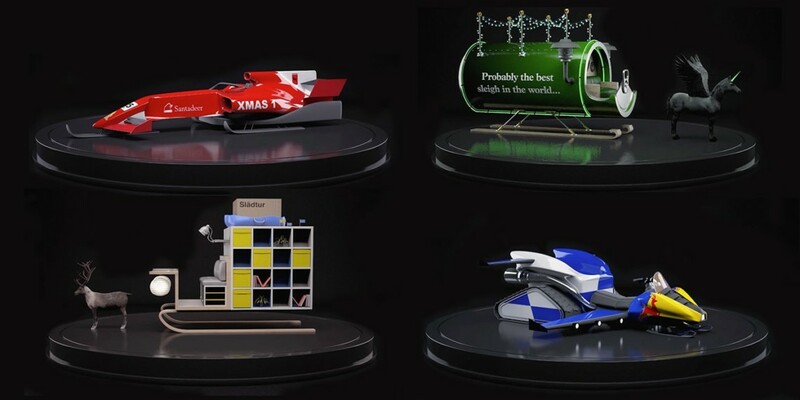 What if marketers like Apple, Ikea and Ferrari reimagined Santa’s sleigh? That question’s not exactly burning a hole in anyone’s brain as we hurtle toward Christmas. Regardless, U.K. gifting company Red Letter Days and digital agency Edit came up with some answers. They envisioned how the jolly elf’s ride would look after redesigns by five companies known for their distinctive and vibrant brand identities. Then, they posted detailed 3D models with tongue-in-cheek vehicle specs on a dedicated website. Edit worked with senior visualizer Charles Townsend of The&Partnership in London, drawing inspiration from the Ferrari’s shape, color, features and sponsorships. As that concept took flight, the team began to wonder how other brand-inspired sleighs would look. “Deciding on which companies to feature was easy,” says Mountain. “We wanted to use brands with strong messaging that people could easily identify” through color and style, with a minimum of graphics and extra explainers. During the concept stage, Apple’s iSleigh proved the toughest (chest)nut to crack.